Ireland is in the grip of unprecedented freezing weather and a collapsing economy - at least there’s plenty to talk about. Alex McDonnell reports as Aisling returns to its spiritual home. We crossed over to Dublin early in December into freezing fog and flooded fields. After breakfast at the always friendly and amazingly generous Collins’s café for freezing emigrants in Portmarnock we were fed and rested after a stressful journey and then headed off into white-out. Niamh Collins and her family always provide an exceptional breakfast for us when we arrive in Dublin and this time was no exception. We said our goodbyes with armfuls of clothes they had collected and cleaned and ironed. Exceptional people! Across the Midlands from Dublin through Westmeath and Longford all we could see from the windshield of our vans was water in the fields and ice on the trees. We dropped Sean off at Frenchpark where his sister was waiting in her car. As soon as we opened the door of the minibus a freezing chill engulfed us. Sean’s sister was in the mood for a chat, mostly about the weather and we listened to her monologue of doom and disaster in modern Ireland for a while before we jumped back in to resume the journey. I jumped in rather too enthusiastically and cracked my head on the bodywork of the van. The van was still rocking from the impact as I curled up in a ball on the side of the road with tears in my eyes turning to icicles (just hoping for a bit of the sympathy I failed to get at the time). Lucky I had a woolly hat on and luckily we would be visiting our good friend Dr. Gerry Cowley later in the day. The freezing fog continued all the way through Roscommon and Mayo and miraculously cleared as we drove over the bridge into Newport. The sun was shining all the way to Mulranny, the sky was bright blue and the trees, fields and mountains crystal clear. 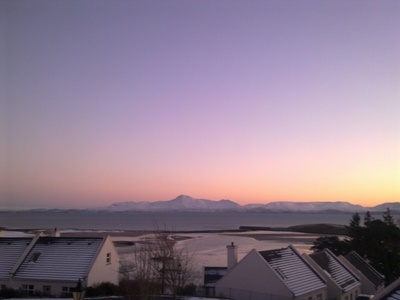 At the cottages in Mulranny looking out of the picture windows across Clew bay we could see Croagh Patrick white with frost rising out of a sea of fog. It seemed like we were in a miraculous hole in a white blanket covering Ireland. Theresa, Gerry’s wife had left some groceries for us at the four houses and Gerry called up to see us on his way back from his rounds in Achill and gave some medicine to Billy and Mick who were ill from the long drive and years of alcohol abuse. He also patched up my bruised head. Gerry is the national leader off the movement for returning emigrants and has been a great supporter of ours for many years. Later in the week Gerry organised a party for us in the community hall with the whole local community. Mulranny always opens up its arms and welcomes us in like an old friend. 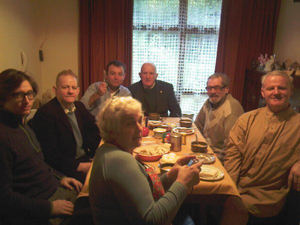 The group with us were from many parts of Ireland as it is not always possible, or desirable for returning emigrants to go to their home county, at least on the first visit home. However we had five who were from Mayo and they were all visiting their families during the week. Michael is from a town only 20 miles from Mulranny and was to visit his mother for a few days during the week. Michael’s father had died a few months ago and he had struggled with his alcohol addiction for years finally going into recovery last year when he visited home for the first time in sobriety since he emigrated. He is still sober now and was looking forward to seeing his mother. We took Thomas out to his sister’s house near Claremorris one day on our way to Knock. There were not only new houses built there since he had last been home but new roads as well and it took a while to find the right one. He didn’t want us to wait outside the house when he went to the door but we parked around the corner while he knocked and stayed long enough to see his sister’s arms wrap around Tom’s back in welcome. Knock has recently been in one of its periodic states of heightened religious fervour. A local business man predicted a visitation from the Virgin Mary the week before our arrival and thousands had turned up to witness the apparition. He was pictured on the front page of the Irish Independent smiling beatifically clasping his hands in prayer looking up to heaven. John reckoned that he wasn’t praying but rubbing his hands together in anticipation of the free publicity. The television news broadcast pictures of the crowds outside the basilica and one woman was interviewed who said that she had stared at the sun for ages and could see a disc like the communion wafer appear before her eyes. God love her. There wasn’t another appearance due to happen until the following week so we would miss the excitement. Nevertheless we headed to Priest-land to have a look around. Charlie was collecting some holy water for one of her clients and a couple of the lads went to the pub in search of their own. We had tea and scones in one of the tea shops and looked into the many souvenir shops. These really are like Aladin’s caves with piles of shiny treasure, rosary beads, miraculous medals, badges, scapulas and all sorts of religious artefacts. We had a great time and bought lots of Christmas presents for the folks back home. On the way to Mulranny John stopped off at Ballaghadereen to pick up a load of meat that his old friend Peter Quinn had arranged for us and so we were well stocked up and wouldn’t need to buy any more for the week. In fact we would be hard pushed to finish it all by the time we were leaving. Some of the lads were well able to cook and were well able to fend for themselves and others and thoroughly enjoyed preparing meals. The often itinerant and mostly precarious life of the immigrant often meant living in hostels without cooking facilities and some are only too pleased to cook and the sense of achievement when others enjoy your cooking is a rare pleasure. Others are institutionalised to the point of not being able to boil a kettle never mind an egg. For the week with Aisling we encourage them to get involved and make an effort. If they can’t make the leap to actually cook anything there are plenty of chores like cleaning and pealing vegetables that anyone can do. By the end of the week we expect to be leaving the houses spotless and everyone to be involved in the job of making that happen. On the Sunday after we arrived some of us went to mass in the neat little church on the edge of Clew Bay. It’s a good opportunity to meet as many of the locals in one place as we can and afterwards we headed out to Achill as the sun was still shining on this one corner of Ireland not in the grip of rain and ice. Keem Bay, on the western edge of Achill is an oasis of calm and beauty after the hectic pace of life in London and driving over the scary cliff road down to the tranquil beach does the soul good. Later we stopped for lunch in Keel as the rain started lashing down again. Chatting with the pub owner we found out that he too had been an emigrant and had worked in Cumbria building the Windscale nuclear power station. The name was changed in the 70’s to Sellafield as if that could change its notorious reputation for leaking radioactive waste into the Irish Sea. Somehow it did. Anyway, we heard some hilarious stories about his times as a jobbing labourer in 1950’s and 60’s Britain. He ended up leaving Windscale after he and a group of Irish men went to the pub for a drink before the Queen was due to officially open the power station. They met some tabloid journalist in the pub who printed a sensationalist story on the front page of his national paper saying that Irish workers at the plant had snubbed her majesty and drunkenly disrupted the ceremony. A pack of lies but mud sticks and he was back on the road again. Some of the gang headed for London and were never seen again but he sensibly came back to Achill eventually and took over the family pub and was living a grand life with one of the world’s great beauty spots outside the pub window and his family around him. A couple of our lads had rueful expressions on their faces as we waved goodbye. Embarrassingly for us our new friend had to come out to the van to ask us to pay the bill for the meal we had. Whoops! James has spent almost all of his life in London and has a soft cockney accent and a quiet shy manner. He is also very independent and likes to have his own space, for instance when I was ordering meals or drinks James always liked to ask for his own. James’s family left their home in the far west of Mayo a long time ago. His parents are dead and he has no brothers or sisters but there are extended family members in Mayo, although James has lost touch with them. We hoped to pick up some of these threads during this visit and we drove out to Belmullet over the spectacular Nephin mountain drive, gloriously alive in bright pin-sharp detail from the hard frost. We had arranged for James to meet up with a family friend and we called her for directions before we set out but we were pointing the wrong way and were nearly back in Balina before we called back and got proper directions. James’s friend lived in a lovely cottage on the side of a hill and she was so happy to see him it was heart-warming. We went back to Belmullet for a couple of hours so they could catch up. The town seems to have loads of furniture and fancy goods shops and we spent an hour or so checking out light fittings and curtains etc while some of the lads were in the pub for their holy water. A woman in one of the shops took a keen interest in Peter, asking a lot of personal questions. Peter was a bit freaked out and we hurried out of the shop, keen to maintain our anonymity. As we got in the van, the woman’s face was at the window of the shop passing comments to one of the shop keepers. It can be hard coming home with any sense of privacy when the whole world seems to want to know your business. We then headed out to see James’s old family home. By the time we got back to his friends house he was waiting for us with presents wrapped for Christmas under his arm and a big grin on his face. Shortly after we waved farewell we were puling into a farmyard to ask directions and while pulling out we almost ran into a woman driving back from the school run with her daughter. She recognised James immediately and it turned out she lived next door to the old house. She showed us the way and had more news for James and it seemed unlikely there would be any claim on the property from any other family members. We walked around the old house and a newer one next to it that had both been abandoned for years. They looked pretty sorry for themselves standing in the overgrown field streaked with rain but James was in a world of wonder remembering happy days running around as free as can be. Gerry and Theresa Cowley had organised the party at the community centre for the Wednesday and we all went in for our pre-Christmas lunch with the fine people of Mulranny seated all around the hall patiently waiting for us to arrive. They clapped as we entered the hall and gave us all a hero’s welcome. After dinner Gerry made a speech reflecting on the struggles generations of Irish emigrants had suffered over the years in England and all around the world. Mulranny is the centre of emigrant services hosting St. Brendan’s village care home for returning emigrants and the Safe-Home project which resettles Irish emigrants into sheltered housing. Gerry handed out presents to us all, there were hundreds of prizes in the raffle and we didn’t win any and as always entertainment was provided by the Molloy Brothers, veterans of the London Irish music scene and we all had a ball. In the weeks leading up to Christmas the shops are always busy but we expected that business would have dropped off following the financial tsunami which hit Ireland like the plagues of Egypt but there were no signs of any slowdown in Castlebar or Balina, or any other of the towns we visited. Shops were packed and people were loaded down with parcels. Maybe it was one last blast on the credit card before cutting it up and going back to cutting turf and milking the donkey. Or maybe not, maybe people will just keep spending as if nothing has happened and maybe nothing has happened, maybe it was all a dream. Certainly the man who blasted the horn of his Toyota 4×4, flashed his lights and shook his fist at me in Castlebar because I managed to find a rare parking space on the street (my van and his ‘car’ being too high to park in the town car park with its height restriction barrier set to discourage Travellers) seemed to be in a hurry to keep spending. Despite Niamhs best efforts to clothe us all James was in need of something warm and all he would wear were cardigans, he couldn’t bear to wear jumpers or sweaters, they were too restricting. We managed to find one in Dunnes which he could afford and we managed to find a few cheap cds, dvds and bits of jewelry for Christmas presents. Billy had applied for resettlement in Newport through the Safe-Home programme and had an appointment to visit the sheltered housing scheme in the town during the week. John took him in for his appointment at the home which is located on a hill above the town looking out over the broad sweep of the river as it passes under the spectacular viaduct. It is a great setting and Billy was very pleased with the place and said there and then that he would move in when a vacancy was available, which would be quite soon. We were a bit concerned about Billy making any snap decisions and suggested that he think long and hard about it but his mind was made up. Billy is from Dublin but he was set on moving to Newport as a friend of his was moving back to the town from London. Billy couldn’t remember the friends name however or where exactly he had moved to and the hill up to the home would be a bit difficult for him as he got older and frailer, quite apart from the quieter pace of life after London. It’s a big step and one we are always anxious to prepare people for. We had contacted Mick’s sister Bridie before we set off to make sure that he could stay with her for a few days. Mick had been drinking heavily for the last few months and we were careful to make sure that he didn’t stop suddenly and we had to monitor his drinking and persuade him to slow down gradually. When Mick, like many heavy drinkers decide to come home they stop drinking immediately and the effect can be like driving into a brick wall, it’s not the speed that will kill you but the stopping. By the middle of the week he was ready to go and we dropped out to Bridies house just off the Dublin road outside Castlebar. Mick has many brothers and sisters but Bridie is the only one that wants to know him these days, she takes him as he is with no moralising. She isn’t afraid that he will try to make a claim on the family land either. John took a group to the mart in Balina one of the days and was able to report that the price of cattle was keeping up but lambs were down. John’s sister Barbara was staying in the town and she had them all over for lunch and Geraldine, another of John’s sisters had invited everyone over for tea, she had them all in the house and apple tarts were hastily prepared and put in the oven for the gathered masses. Geraldine is well used to catering for large numbers as she has 8 sons and a couple of foster boys too. They all rolled back to Mulranny with full bellies like the cattle at the mart. The weather seemed to get worse as the week passed and we watched the forecasts closely looking for any information that might tell us how the weather might be for our journey home. It was looking very unsafe and we were afraid that the ferries might be cancelled. A few weeks before we crossed over on this trip we had taken a group to Waterford for a ‘dry’ trip and on the way back we were turned away at Rosslare harbour because the ferry had been cancelled due to bad weather. Every time we come through Rosslare we always seem to manage to queue up at the kiosk which our nemesis occupies. She is a middle aged woman who seems to take great pleasure in any difficulty she can make for us (not only us I am sure but it seems that way). The weather seemed particularly calm and we had rang the ferry company the day before for updates but as we arrived at the ferry port it seemed particularly quiet. Our nemesis looked out of her kiosk at us with a little smirk on her sour face, ‘Can I help you?’ she asked. ‘We are booked on the ferry’ John said, passing over the paper work from the window of the mini bus. She scrutinised the papers looked at our van, counted the number of passengers, consulted her computer screen then said, her smirk now a big smile, ‘Your ferry has been cancelled’. They had all been cancelled. On that trip we had spent a great week in Waterford with a group of our clients who had recovered from years of heavy drinking and a group from Kairos in Camberwell. The Kairos Trust is a rehab project that has a particularly good success rate with long term Irish drinkers and John has managed to get many of our clients through the programme over the years. Mossie, from Kerry is the manager and he joined us during the trip. We stayed in cottages in Dunmore East and at that time in November, although the weather was particularly good the seas were rough and there were very few people staying there and the manager of the holiday village let us back for one more day free of charge while we waited for the weather to improve. Luckily the ferry went ahead the next day, much to the disappointment of the nemesis when we rolled up for the ferry the next day. She managed to cause a bit of fuss because we were a day late but there wasn’t much she could do about that and we crossed over and arrived in London a day later and we were no worse for that. Back in Mayo, according to the long range forecast, the Saturday we were due to sail was going to be stormy although the ferry company decides on sailings on a day to day basis. It was also rough on the Thursday but Friday looked like it was going to be calm so we decided to leave Mayo early Friday morning and catch the one ferry that looked like it may be travelling out from Dublin at 8.00am. We said goodbye to the friends we had made this time and all those we had made over the years in Mulranny at Docherty’s pub on Thursday evening. The lads staying with their families came back that night and we got to bed early. We were up at 3.00am and soon we were driving east through the eerie landscape of waterlogged Ireland, Sean was waiting in his sister’s car as we drove into Frenchpark. I stayed in the van this time and waved goodbye to her. The ferry left as scheduled but those before and for a few days after we sailed were cancelled, so we made the right decision.